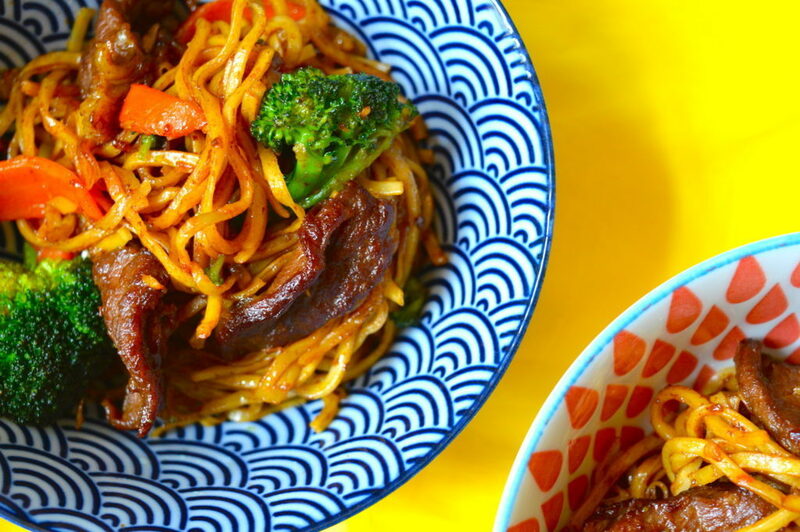 If you’re after a quick and delicious meal to celebrate the Year of the Dog, look no further than these tasty beefy fried noodles. Noodles, with their long spindly tendrils, are thought to be good luck at Chinese New Year because they symbolise long life. 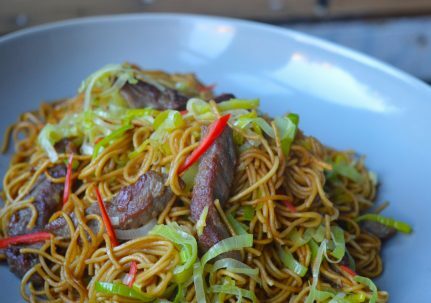 To celebrate we’re sharing one of our favourite noodle recipes, which we call ‘juicy’ beef noodles. In the same vein as our popular Market Chicken Fried Noodles, the secret to this dish is the creation of a silky savoury gravy that coats every strand of noodles. 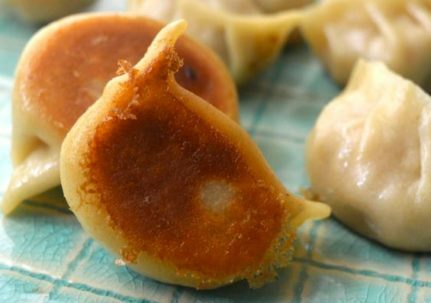 For more CNY ideas, check out our recipes for pork potsticker dumplings, spicy potstickers and beef fried rice noodles. 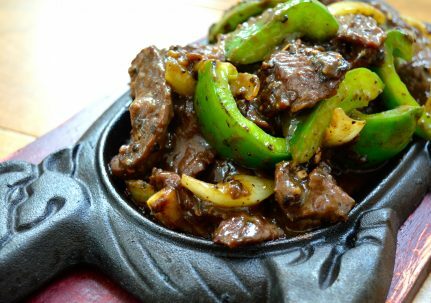 Combine the beef with the marinade ingredients, then set aside. Ideally, leave the beef to marinate for at least 4 hours. In a pinch, half an hour will do! Soak the noodles until just al dente, then drain and set aside. Put your wok over a high heat. Add a splash of vegetable oil, and quickly fry half of the garlic and ginger. Brown off both sides of the beef. Add 80 ml water and the oyster sauce. Stir to combine, then set aside in a bowl. Wipe your wok with some kitchen towel, then set it over a high heat again. Add a small splash of vegetable oil, and quickly from the remaining garlic and ginger. Add the carrots and broccoli and toss in the oil for 1 minute. Pour in 80ml of cold water and cover with a lid. This step will trap in the wok hei (the smoky flavours or ‘breath’ of the wok). Cook the veg for 2 minutes until they are just tender, then uncover and reduce the heat to medium. Return the beef and gravy to the wok, along with the noodles and dark soy sauce. 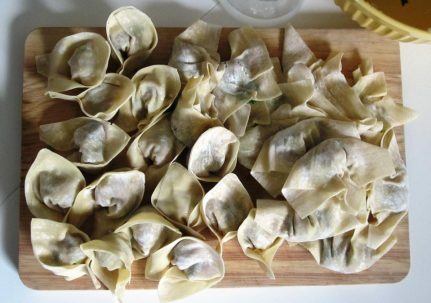 Toss the noodles until they are evenly coated with the seasonings and warmed through. If you find the noodles a bit too hard, sprinkle cold water onto them as you toss. Turn off the heat and stir through a few sprinkles of sesame oil to taste. Fantastic recipe. Going to treat my family to this on the weekend. Thanks Dumpling Sisters! You don’t say in the instructions what to do with the ginger and garlic! Add half the garlic and ginger after heating up the oil, just before adding in the beef. Use the after half after heating the oil just before adding the vegetables.